I vividly remember playing my electric piano through a phase shifter. I gigged with it when I didn’t have to move it very far. I actually had four of the same models for a brief time. Three were free or nearly free because they were in such bad shape and I used them to keep the playable one…playable. It was a great instrument but as technology got better, lighter and more reliable I moved on. The thing I missed about that instrument was the simple setup and interface. That simple setup and interface is what I love about the E.Piano Section of the CP73/88. The timelessness of the one-to-one interface gives this instrument a proper old school vibe. In this article I’ll focus on the sounds in each category how the Tone, Drive and interact with the sound. The Effects are an integral component of the E. Piano Section, so I’ll cover those before jumping into the Voice Categories. These six effects focus on modulation, wah-wah and compression. The [DEPTH] and [RATE] knobs allow fast and effective changes without having to think too much! For each of these effects I’ve included a link to a Soundcloud audio demo along with a Soundmondo LIVE SET you can download to your CP73/88 that utilize the effect. Comp: This is a stereo compressor that affects the dynamic range of the sound, so lower velocities sound a bit louder and higher velocitiessound a bit softer. Compressors on electric pianos even out the overall output and sometimes sit better in a mix. They can also add a bit more punch to the sound. The [DEPTH] knob adjusts the amount of compression and the [RATE] knob adjusts the volume output of the compressor. (LIVE SET: “CompressedRd78”). In the audio example below you'll hear the example first with the compressor off then you'll hear it again with it on. The second Section Effect is dedicated to modulation effects like Chorus and VCM (Virtual Circuitry Modeling) Flanger and Phaser Effects (Note: The Wah effects mentioned above are also VCM). Each have dedicated [DEPTH]and [SPEED] control knobs. These effects are important stomp box effects in an electric piano set up. Cho 2: Chorus 2 comes from the legendary detune effect found on the TX816 tone generator. It generates a nice thick texture sound. The [DEPTH] knob changes the amount of effect and the [SPEED] knob changes the chorus speed. (LIVE SET: “Chorus2MellowDX”). Flang: The VCM Flangeris a stereo flanger that takes a signal, copies it and uses a phase shift to vary the timing of the signal before recombining them. The term comes from the origin of the effect where a sound is recorded simultaneously to two tape recorders then replayed with both recorders synced. The engineer places a finger on the “flange” rim of one of the playback reels to produce the phased sound and records that to a third recorder. Rather than ship the CP73/88 with three tape recorders like we wanted (!) we used Virtual Circuity Modeling technology to recreate that effect. [DEPTH] increases the feedback amount and [SPEED] adjusts the flange speed. (LIVE SET: “Flanged75Rd”). LIVE SET: "73Rd Drive Off"
LIVE SET: "73Rd Drive On"
Let’s take a look at each Category in the E. Piano Section and how the Section Effects enhance the sound. 78Rd: This electric piano has the most “modern” sound with a nice tine ring (especially at lower velocities) and is very dynamic. Definitely useful in funk, jazz fusion and modern pop/rock/R&B. 75Rd Funky: “Bark” is a term you hear quite a lot when describing tine electric pianos. It’s that “growly” sound that occurs when you play at high velocities—hence the term “bark”—and 75Rd Funky has the most bark of any of the models in the Rd Voice Category. I love this Voice for 70s funk and jazz, aggressive R&B, hip-hop, etc. Any type of music where you are looking for that aggressive electric piano sound. 73Rd: The history of what we know as the tine piano effectively starts around 1965 with “Seventy Three” (which was spelled out in that classic cool font on the right of the original instrument). In 1969 the hammers in that model if tine piano changed from felt to neoprene and with that the timbre changed. The 78Rd and the 75Rd Funky have that neoprene sound, which was brighter and more aggressive. The 73Rd Voice has the felt hammer sound: darker, rounder and a bit mellower. This is a great choice for classic R&B, jazz, ballads, etc. 67Rd Dark: This Voice is part of CP OS v1.1. The actual instrument that was recorded came from a backline company in Los Angeles and is used in recording sessions, television shows and concerts when a 100% authentic and fully restored 1967 tine electric piano is requested. This instrument has an exceptionally distinct quality with an interesting tine sound and a “played-in” timbre. Great for an old school sound. 67Rd Bright: Exactly as the name suggests, this is a brighter version of the classic ’67. WrWarm: This sound has the warmest character and is perfect for ballads. Adding DRIVE gives it more presence and the Tremolo effect adds that soulful vibe. WrBright: I love the brighter quality of this reed piano for pop songs. I find it a sits a bit more prominently in a mix and it’s great with DRIVE and compression. WrWide: The Wr Wide comes with the CP OS v1.1 update. This instrument belongs to Scott Plunkett and is in pristine condition. An interesting thing about the actual instrument: The internal transformer was removed and placed in a box to eliminate hum so the sound is absolutely perfect. The character of this instrument sits right between the Warm and Bright Wr versions and it has a wide dynamic range. The Clv Voice Category represent the plucked instruments. The Clavi B and S are popular in pop, funk, R&B and reggae. The predecessor to these instruments is the Harpsichord which is the other Voice in this Category. Clavi B: On a traditional Clavi there are controls that change the tone and pickup position in relation to the internal plectrum mechanism. Adjusting these controls changes the tone. Clavi B is a mellower version that is great for chord comping. It shines with chorus or phaser applied. Clavi S: This version puts the pickup closer to the plectrum and has a brighter sound overall. With Touch or Pedal Wahyou can get your funk on. Harpsichord: The Harpsichord in CP73/88 is quite good. I love the pronounced key-off sound: It gives it a serious authenticity. It works great for traditional baroque music but adding effects can take you to new creative places.Try Ring Modulation and Phaser, add some delay and reverb and you will find something entirely cool with the Harpsichord Voice. DX Legend: The classic FM piano sound of the DX7. This was a defining sound of the 80s and we had to include it in the CP73/88. For maximum authenticity use the Chorus 2 effect to give it that finishing touch. DX Woody: FM Synthesis does a great job creating woody percussive attacks. This Voice has a cool woody attack that sounds cool with Auto Pan, Tremolo and of the Phasers. DX FTine: Similar to DX Legend, DX FTine (Full Tine) is a bit darker with a pronounced tine “pop” at higher velocities. DX7 II: The DX7 II featured a new dual mode and a wider range of expressiveness. This Voice comes from that later DX version and has an interesting timbral change from low to high velocities and sounds great with Tremolo or Auto Pan and Chorus or Phaser. DX Mellow: Exactly as described. This is a nice Voice as a layer behind a Voice from the Piano Section. With a modulation effect like Chorus, Flangeror Phaser you can get some great pad sounds from this Voice. DX Crisp: The pronounced attack on this Voice is pretty cool and it cuts nicely in a mix. I like experimenting with the Ring Mod effect and its cool when creating delay loops. The real time control, expressiveness and overall great sound quality of the Voices and Effects in the E.Piano Section offer a wide range of creative directions. 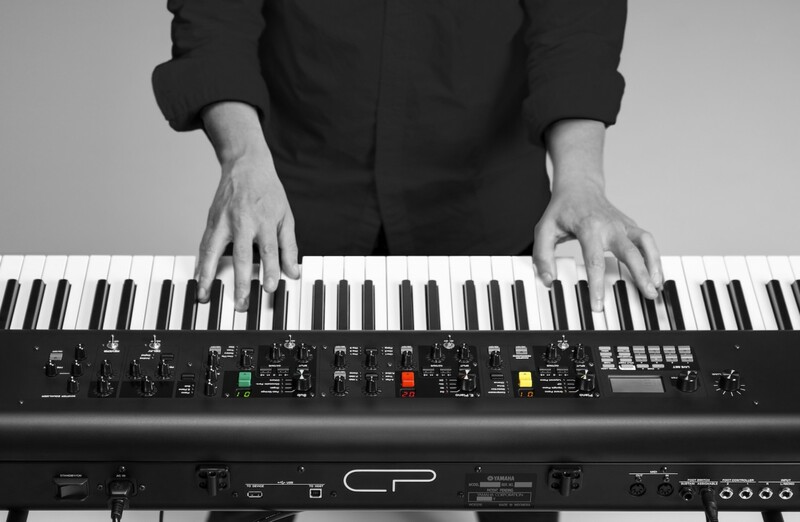 Experimentation is easy and fun with the one-to-one user interface of the CP73/88. Stay tuned for more articles in the Mastering CP series!